The phenomenon, which has spread to several universities across China, has prompted debate about whether parents are coddling the generation of only children born after China’s one-child policy was adopted in 1979, and undermining their independence. TIANJIN, China — When Yang Zheyu arrived at Tianjin University this fall for the start of his first year, he had all the essentials. Winter coat. Dictionary. Four pairs of shoes. Toothpaste. And a few hundred yards from his dormitory, in a cobalt-blue tent set up on the floor of a gymnasium, he had his mother at his beck and call, ready to bring him bowls of instant noodles, buy him soap and scrub the floor of his new room. Yang’s mother, Ding Hongyan, a farmer, was one of more than 1,000 parents of the class of 2022 who camped out in tents this month to watch over their children as they settled into college. The parents came bearing bags of sunflower seeds, Hello Kitty backpacks stuffed with toilet paper and unsolicited advice on a variety of topics: the acceptable price of steamed dumplings ($1.50), the most lucrative college majors (engineering was a favorite) and the appropriateness of dating (best to be avoided while studying). Since 2012, Tianjin University, about two hours southeast of Beijing, has offered the “tents of love” for free with the aim of making it easier for poor families to take part in the college move-in tradition. But the phenomenon, which has spread to several universities across China, has prompted debate about whether parents are coddling the generation of only children born after China’s one-child policy was adopted in 1979, and undermining their independence. The policy was abolished beginning in 2016. Older generations of Chinese, who suffered through extreme poverty and the chaos of the Cultural Revolution of the 1960s and 1970s, have criticized parents who make long, arduous journeys to live in the tents, saying they are raising children unaccustomed to hardship, or “little emperors,” as they are derisively called. Younger Chinese, who grew up in China’s boom years, say they are decidedly self-sufficient. The debate over the tents, which also has played out online, reflects the rapid pace of change in China and the relative novelty of the college experience and its various rituals. Many young people in China today are the first in their families to go to college. The government has opened hundreds of universities in recent years, and enrollment has surged, reaching 37.8 million students last year, up more than 20 percent since 2010. 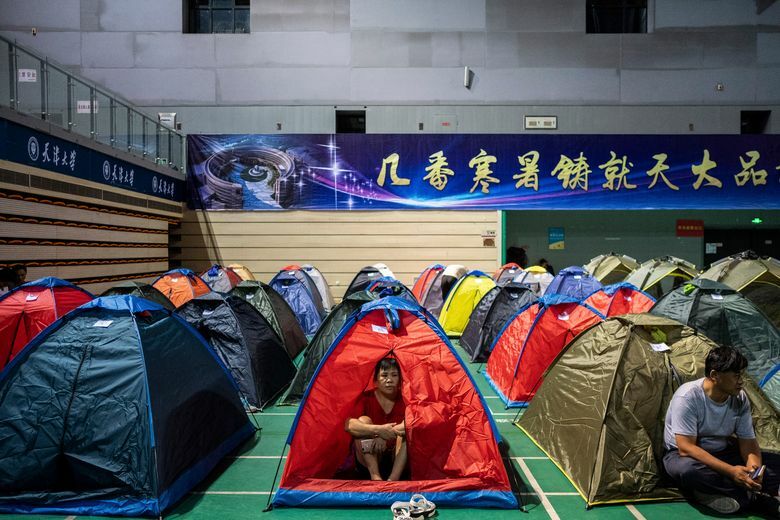 At Tianjin University, parents said they had signed up for the tents because they were nervous about sending their children long distances and couldn’t afford accommodations in big cities. Many of them come from rural areas, where they work as farmers, teachers and construction workers. Yang Luping, an English teacher from rural China, reminded her daughter that soon she would have to learn to do her own laundry now that she was in college. “I already know how,” her daughter, Lu Yizhuo, interrupted. Yang is a self-described “tiger mom” who worked for years to ensure that her daughter got into a good university. When her daughter was young, she bought her Barbie dolls to encourage her studies. She sent her to boarding school and washed her clothes every weekend when she came home. Yang refers to her daughter as a “gift sent to me by the heavens.” She said it was important that her daughter began the school year with a sense of support from her family.